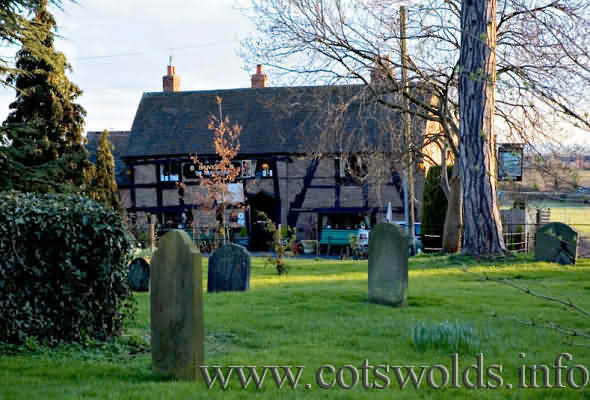 The Mug House is a traditional public house located in the village of Claines, Worcestershire, England which dates back to the 15th century. This ancient pub is unique; it is the only pub that stands on consecrated ground, this one time church brew house was built at least 600years ago and perhaps sometime beyond, it has an history that goes back to the time of the Plantagenets and the House of Lancaster. Brew houses were at one time an essential form of income for the church for with some 75 feast days to celebrate it meant money for the coffers of the church. As with all church alehouses it came under scrutiny by the Puritans who closed most the ale houses because of the drunken and lewd behaviour of the populace at the time. So the uniqueness of the Mug House in present times is there to be seen and enjoyed. Other such ale houses may have survived destruction but no longer operate as licensed premises. In modern times an external wall was damaged during a violent storm, it was when repairs were being carried out that the silver head of a Bishops Crosier was found in the wall, later investigations revealed that it once belonged to the Bishop of Worcester - but why was it there? and when was it placed there?and by whom?, a real mystery. The crosier is now used by the Boy Bishop. The Mug House also is known to be a haunted place, things move about in the cellar for when the Licencee Is attending to the barrels - the mallet used is mysteriously moved from one side of the cellar to the other, this action has been put down to that of a mischievous child, doors open and close without apparent cause. In one of the rooms dogs raise their hackles and stare at the fireplace. There have been other instances for when a group of people stopped overnight in the cellar for the purpose of raising money for charity they reported hearing the voices of children singing Pop goes the Weasel. This song that was once a nursery rhyme was of 17th century origins. A team of ghost hunters from a Television programme have also spent a night on the premises, they reported that they were aware of the presence of the spirit of a previous landlord, as with all the stories that relate to this haunting, the spirits are benign. Orbs have also been seen and photographed in several places in the pub. Besides these details, Ley Line hunters found a Ley Line from the cellar to the church, this coincides with reports that a tunnel once existed between the church and the pubs cellar. The Mug House is indeed a welcoming place and a sense of ease is felt when in the premises.